I love seeing clothing refashions on other blogs, but since my sewing skills are so limited I am always too scared to try them. 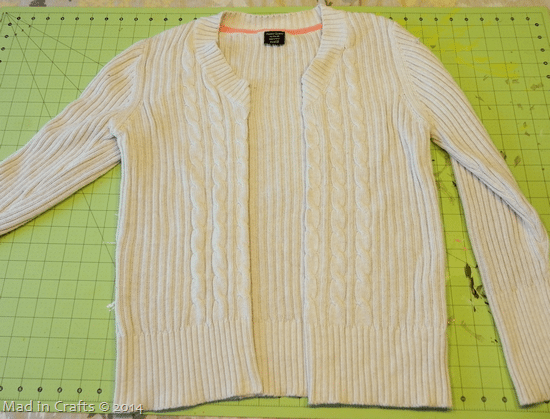 For this sweater to cardigan tutorial, I was able to create a new and useable item for my wardrobe without any sewing at all. The frosting on the cake is the temporary pop of color thanks to Duck Brand Craft Tapes! I had an inexpensive cable knit sweater taking up space in my closet. I love cable knits, but this particular sweater was a weird length, and I just didn’t get much use out of it. I knew it would be much more useful to me as a cute cardigan, so I got to work. Here’s how to do it. 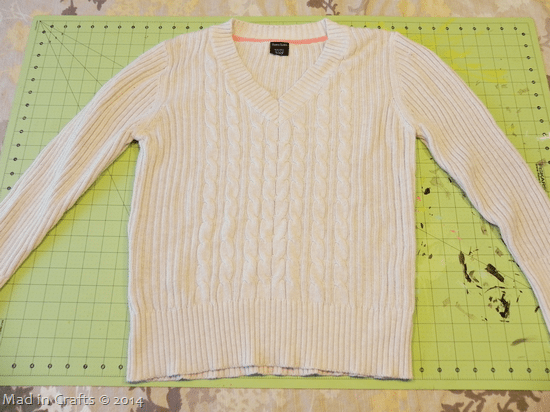 Start by laying the sweater out flat on a hard surface like a table or the floor. 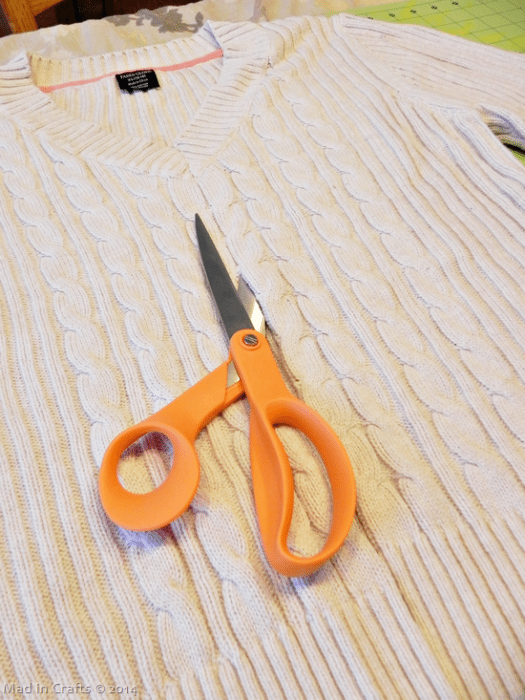 Using a pair of sharp scissors, cut the front of the sweater up the middle. Try to keep the line as straight as possible. When you have cut all the way up through the front of the neckline, you should have something that looks like this. See it’s almost a cardigan already! 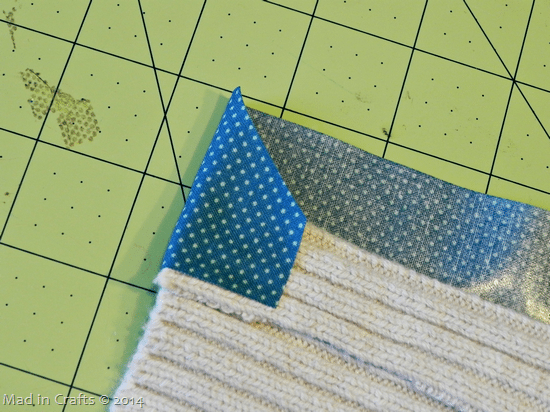 Cut a length of fabric adhesive tape (affiliate link) the same length as your newly cut edge. 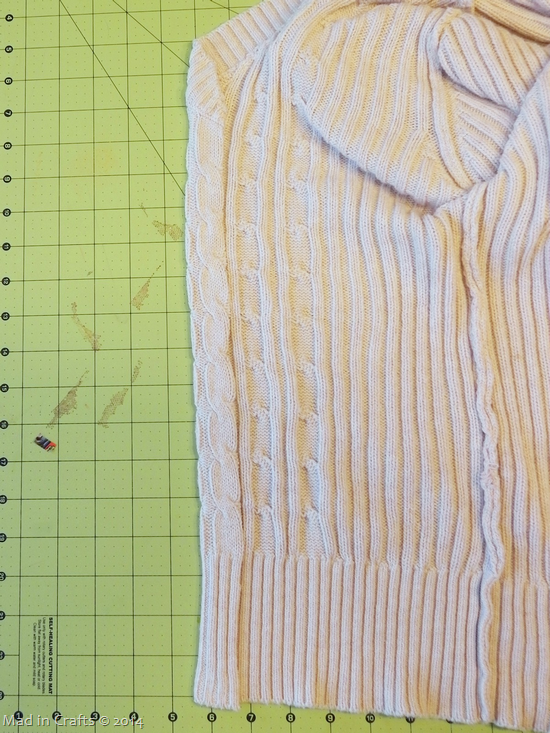 Carefully place it on the WRONG side of the fabric (the inside of the sweater). with the other side of the front of the cardigan. This is a permanent, washable way to “hem” the sweater. Now you have two clean front edges. Just like that, you have a cozy new cardi! But I wanted to take things a step further and accessorize the sweater with a bit of color and pattern. Duck Brand® recently released a few lines of crafting tape: glitter, prism, washi, and fabric. I used their blue pin dot fabric tape, but the fabric tape also comes in yellow speckle dot, pink with brown dots, and coral multi-color. 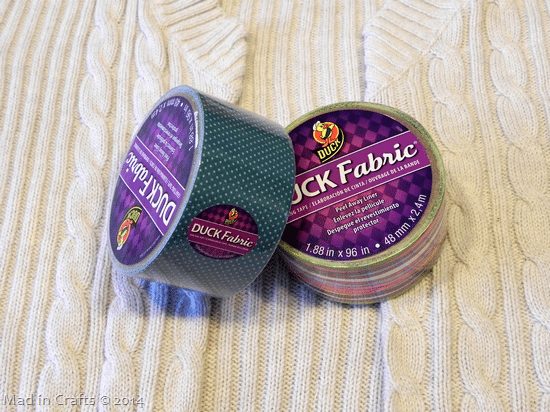 The Duck® Fabric tape allows you to add fabric to a project without any additional sewing or adhesive. The possibilities are off the chart with this stuff. 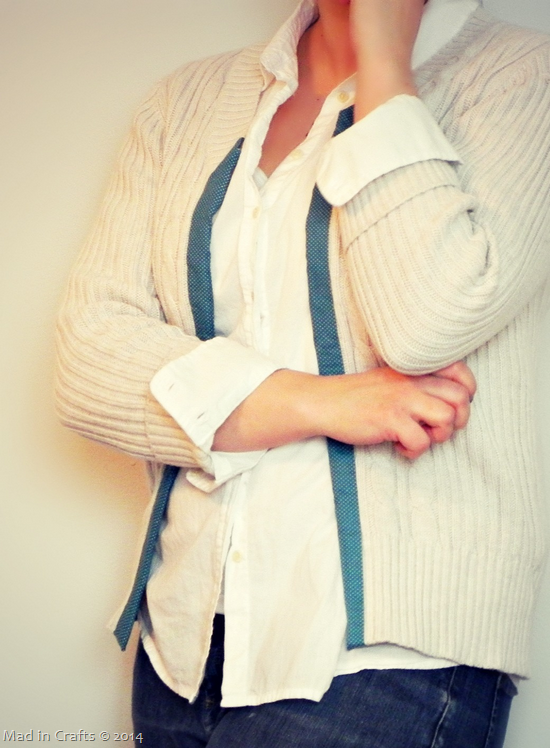 Cut two lengths of fabric tape that are 1” longer than the length of your cardigan edge. 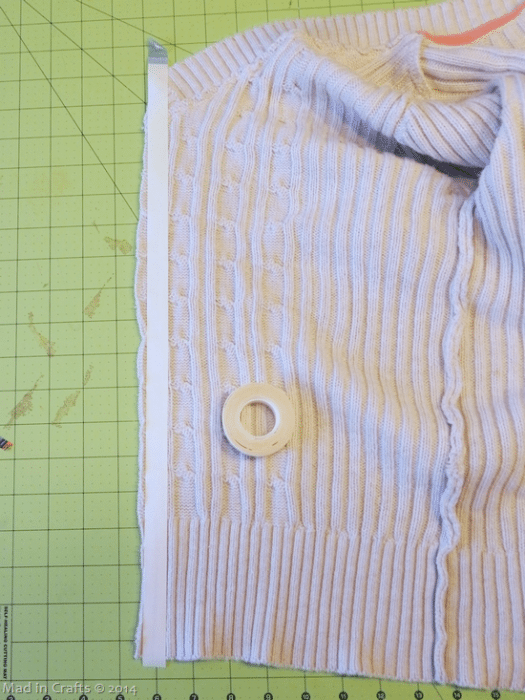 Remove the backing from the tape and carefully place it on the front of one of the cardigan edges. 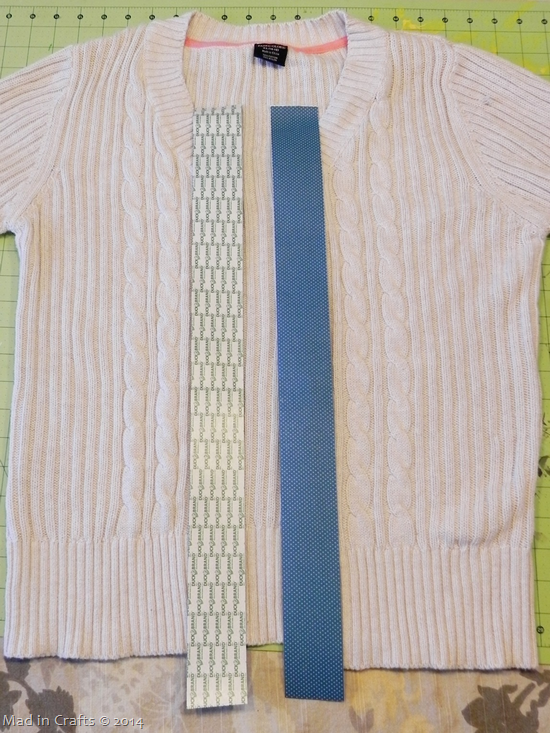 Half of the tape width should be adhered to the sweater and half should not be stuck to anything yet. Flip the sweater over, and tuck each end of the fabric tape over the waistband and neckline of the sweater. 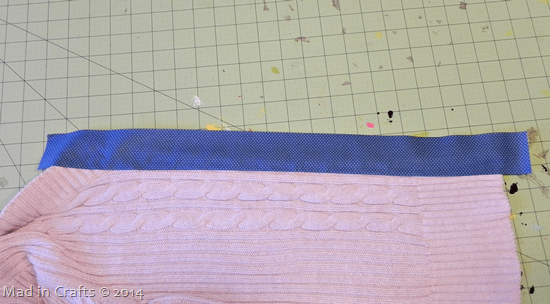 then fold the fabric tape over to the inside of the cardigan edge, sealing the whole edge in fabric tape. Repeat those steps with the other side of the cardigan. Now your cardi has a cute contrasting trim, and nobody has to know there was no sewing involved! 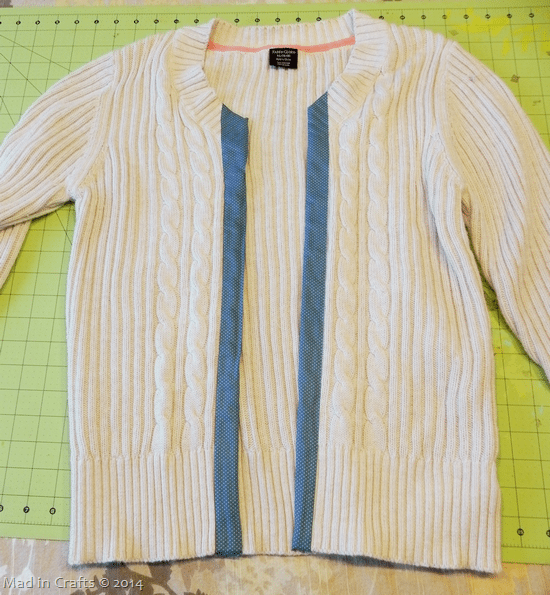 When you are tired of the blue, gently pull the tape off and the sweater will be as good as new. NOTE: The Duck Brand® fabric tape is NOT washable. As an experiment, I threw my sweater in the washer with the tape still attached and it totally fell off. 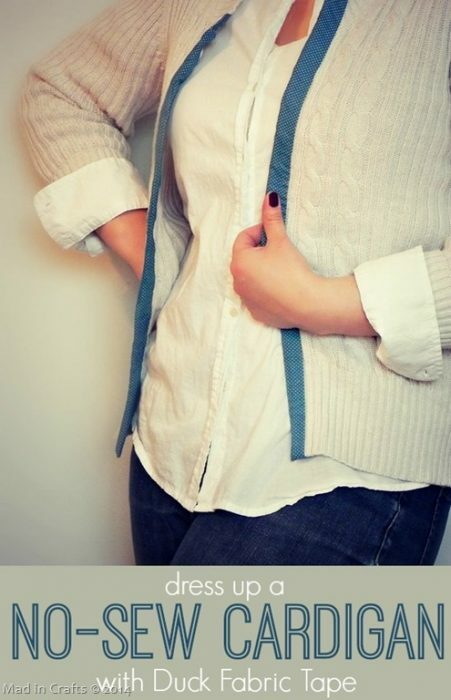 This is just a temporary way to dress up your cardigan. You know how I love duck tape crafts, so if you are inspired to make your own be sure to include #DuckTapeCrafts in your social media shares so I can find them! You can find more Duck Brand® inspiration by following them on twitter, too. If you would like to try out some of Duck Brand’s® new crafting tapes, enter the Rafflecopter giveaway below. You will receive a surprise package of tape sent from IZEA.